The Philadelphia Eagles were sporting a 6-1 record as they hosted the tough Chicago Bears on November 5, 1961. 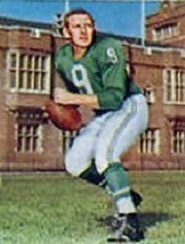 The Eagles had been forced to make key offseason moves after winning the 1960 NFL Championship since both Head Coach Buck Shaw and star QB Norm Van Brocklin had chosen to retire. Taking their place were Nick Skorich, promoted from line coach to head coach, and QB Sonny Jurgensen (pictured at right), who had been waiting for his opportunity since coming to Philadelphia as a fourth round draft choice out of Duke in 1957. Now he was making the most of it, proving to be a highly productive passer, and with capable receivers available in flanker Tommy McDonald and ends Pete Retzlaff and Bobby Walston, who was also the team’s experienced placekicker. The Bears were 5-2 and had a four-game winning streak coming into Philadelphia. 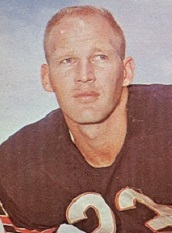 Under the guidance of owner and Head Coach George Halas, Chicago also had notable newcomers in QB Bill Wade, obtained from the Rams, and rookie TE Mike Ditka. The defense was solid and experienced, with the line anchored by DE Doug Atkins, Bill George at middle linebacker flanked by Joe Fortunato and Larry Morris, and the backfield featuring cornerbacks Dave Whitsell and J.C. Caroline and safeties Roosevelt Taylor and Richie Petitbon. There were 60,671 fans in attendance at Franklin Field on an unseasonably warm day. The Eagles had the game’s first possession and advanced into Chicago territory. Sonny Jurgensen threw to Pete Retzlaff for an 18-yard gain on a third-and-eight play and a pass to Tommy McDonald picked up 12 yards. However, facing third-and-one at the Chicago 33, Jurgensen was sacked for a loss of eight yards by Doug Atkins and DE Bob Kilcullen, and Bobby Walston’s long field goal attempt was blocked. The Bears had good field position to start at their 48 but an attempt to convert a fourth down at the Philadelphia 43 was stopped short. After being moved back by a holding penalty, the Eagles began to move as Jurgensen threw to Walston for eight yards and FB Clarence Peaks ran for 15 more. Jurgensen converted a third-and-eight situation with a pass to McDonald for 19 yards to the Chicago 20 and followed up with a throw to Retzlaff for another eight yards. The drive finally stalled at the five yard line and Walston kicked a 12-yard field goal for a 3-0 lead. Chicago wasted little time in responding as, on the second play following the ensuing kickoff, Bill Wade threw deep to Mike Ditka for a 76-yard touchdown. Roger LeClerc kicked the extra point and the visitors were up by 7-3. The Eagles benefited from a pass interference penalty on Roosevelt Taylor that was good for 36 yards on a third down play, but after reaching the Chicago 28 they were stopped in a fourth-and-two situation. As the game entered the second quarter, the Bears had to punt and Philadelphia advanced 78 yards in five plays. Runs by HB Billy Barnes and Peaks got a first down and the Eagles got another when Jurgensen completed a pass to Walston for nine yards and HB Ted Dean ran for four. Jurgensen then fired long for McDonald, who got beyond Taylor for a 55-yard touchdown. Walston converted and the home team was back in front by 10-7. The Bears had to punt following their next possession but got the ball back quickly when Dave Whitsell (pictured at left) intercepted a Jurgensen pass and returned it 52 yards to the Philadelphia five. Two plays later, FB Rick Casares ran for a two-yard TD and, with LeClerc’s extra point, Chicago was ahead by 14-10. The Eagles drove into Chicago territory as Jurgensen threw to Walston for 13 yards and McDonald for 14, but facing third-and-10 at the visitors’ 30 it was Richie Petitbon coming up with an interception to blunt the threat. Casares ran three times to give the Bears a first down at the two-minute warning, but a delay of game penalty and sack of Wade moved the visitors back and they ultimately were forced to punt. Ed Brown’s kick sailed 69 yards, and two long Jurgensen completions were nullified by backfield in motion penalties. The score remained unchanged at halftime. The teams exchanged punts to start the third quarter. A 21-yard return by DB Irv Cross gave the Eagles good field position at the Chicago 40, but they were unable to move on offense and Walston’s 44-yard field goal attempt was wide to the right. The Bears, now with strong-armed QB Ed Brown behind center, again had to punt and Cross had another good return, gaining 20 yards to the Philadelphia 47. Barnes had a 15-yard run and Jurgensen rolled out and threw to Peaks for 33 yards to the Chicago eight. Peaks ran for a three-yard TD, and while LB Joe Fortunato blocked Walston’s extra point attempt, the Eagles were in the lead by two points. The Bears were on the move as the game headed into the fourth quarter. HB Willie Galimore had a 16-yard run, Casares dove for three yards on a third-and-one play, and Galimore ran three more times for another 16 yards. However, after reaching the Philadelphia 11, the drive stalled and LeClerc was wide on an 18-yard field goal try. Once again Whitsell intercepted a Jurgensen pass, this time returning it 19 yards to the Philadelphia 19. Casares ran effectively to get the ball inside the ten, but the visitors were stopped there and, with Brown now attempting a field goal from 13 yards, Cross deflected the kick and it sailed wide to the right. The Eagles went three-and-out and punted, but the Bears were unable to get beyond their own 40 on the ensuing possession. Most significantly, CB Tom Brookshier, the defensive captain, went down with a compound fracture of his leg on a second down play. 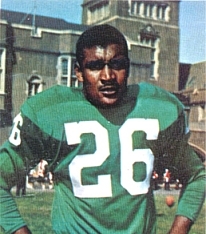 Brown’s punt traveled 56 yards and came to rest at the Philadelphia four. With Peaks primarily running the ball, most notably on a three-yard carry for a first down on a third down play, and the Bears called for a personal foul, the Eagles maintained possession for the remaining time, holding on for a 16-14 win. Philadelphia far outgained the Bears (342 to 215), especially in net passing yards (237 to 89), and also had a clear edge in first downs (19 to 9). However, the Eagles also accounted for the game’s only three turnovers. Chicago was penalized seven times, at a cost of 94 yards, to five flags thrown on Philadelphia. Ultimately, it came down to the failure of the Bears to connect on either of their short field goal attempts in the fourth quarter. Sonny Jurgensen completed 18 of 33 passes for 249 yards and a touchdown, but gave up three interceptions. Tommy McDonald had 6 catches for 109 yards and a TD. Clarence Peaks (pictured above) rushed for 62 yards on 16 carries that included a score and also contributed four pass receptions for another 61 yards. Irv Cross averaged 14.3 yards on four punt returns. For the Bears, Bill Wade and Ed Brown completed four passes between them out of 12 attempts, with Wade throwing for 85 yards and a TD. Brown also averaged 48.1 yards on seven punts. Mike Ditka gained a team-leading 76 yards on his lone long touchdown reception. Rick Casares gained 65 yards on 17 rushing attempts that included a TD and Willie Galimore added 42 yards on 13 carries. On defense, Dave Whitsell accounted for two of Chicago’s three interceptions and returned them for a combined 71 yards. The Eagles lost to the conference-rival Giants and Browns the next two weeks, and another loss to New York ultimately cost them a second Eastern title. They finished with a 10-4 record, just behind the 10-3-1 Giants. Chicago lost three of its next four games to drop out of contention in the Western Conference, ending up at 8-6 and tied with the Colts in third place. The loss of Tom Brookshier (pictured at right) proved critical to the Eagles, for his leadership as well as outstanding defensive play. 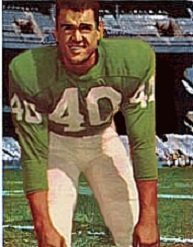 Tough, if not especially fast, and an excellent tackler, Brookshier had been selected to the previous two Pro Bowls and received consensus first-team All-NFL honors following the 1960 championship season. In his place, the Eagles used Irv Cross and Glen Amerson, both rookies, and it was a factor in the defeats that followed. While it wasn’t known at the time, the injury proved to be career-ending. Brookshier attempted to come back in ’62 but was forced to retire, entering into a long career as a broadcaster.